Jaipur, 23 March: An exhibition focused on the work of eminent theater exponent of India- Mr. Ebrahim Alkazi will be held at Jawahar Kala Kendra from 27 March to 6 May. Entitled, ‘The Theater of E. Alkazi’, the exhibition is a retrospective of Ebrahim Alkazi’s theatre work, which spans a period of 50 years. It has been curated by Amal Allana and designed by Nissar Allana. The exhibition will be inaugurated as a part of the celebrations of Rajasthan Divas & World Theatre Day. It has been organised in association with Department of Tourism, Government of Rajasthan. Alkazi is a legendary figure of Indian theatre whose remarkable achievements have earned him the Padma Vibhushan, among a vast number of Lifetime Achievement Awards. Alkazi’s story runs parallel to the Independence Movement and the birth of Indian modernism in the theatre. He introduced revolutionary idea in theatre as early as the 1950s in scenic design, lighting, modern ideas of acting drawing from international traditions and linking these ideas to the performing folk traditions of India. He evolved new training methodologies for student actors, directors and stage designers and spoke about new ethics and philosophy in theatre. 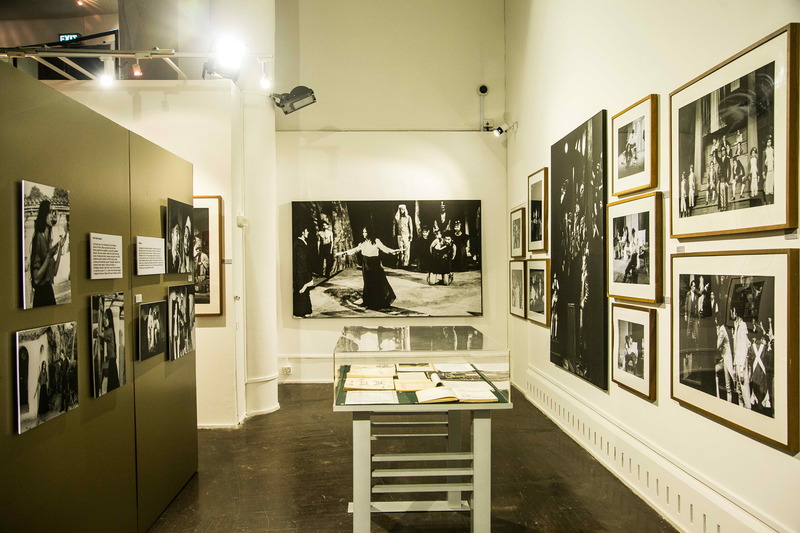 The exhibition features multiple rooms of rare photographs, objects, archival documents, models of stage sets, using a multi media approach to exposing Alkazi’s vision and ideas. The exhibition shows, for the first time, Alkazi’s work from the 1940s and 1950s — work that has rarely been seen anywhere in India, and brings a vast treasure of archival material into the public domain. The exhibition will be inaugurated by the eminent theatre director, Mr. Mohan Maharishi, on 27 March, at the Museum Galleries of JKK, followed by a film on Alkazi. Seema Biswas,trained by Alkazi, will present a solo act, ‘Jeevit Ya Mrit’ directed by Anuradha Kapur. The play willbe staged in the auditorium at JKK later that evening. As a part of the exhibition, a seminar will be organized on 28 March. The seminar participants include eminent theatre personalities Amal Allana and Hema Singh. Theatre professionals Ashok Banthia and Vishal Vijay will also participate. The exhibition will be on display at the refurbished Museum Galleries of Jawahar Kala Kendra till 6 May (Closed on Mondays and Public Holidays). These Galleries are equipped with state of the art lighting systems matching the international galleries standards. Amal Allana is an Indian theatre director, and costume designer and served for 8 years as the Chairperson of National School of Drama, India’s premier institute of Theatre training. As a theatre director, she has directed over 60 plays in Hindi, including notable plays like, AadheAdhure (Mohan Rakesh), Khamosh, AdalatJariHai (Vijay Tendulkar adaptation of 1956 short-story), AshadhKa Ek Din (Mohan Rakesh), Hayavadana (by Girish Karnad), Mahabhoj (Mannu Bhandari) (1982), King Lear, Himmat Mai (Mother Courage), NatiBinodini (2006) and Begum Barve and ‘Erendira and her Heartless Grandmother’(Satish Alekar), many of which are known to have set trends in Indian theatre. Nissar Allana is a scenographer and light designer of international repute and has designed sets & lights for over 65 theatre & television productions, and designed lights for the son-et-lumiere at Golconda Fort and in Port Blair. His major works include sets and lights for Operas “Fakir of Benaras” by Muzaffar Ali, and “The Pearl Fishers” by Patricia Panton, Set Decorator for Richard Attenborough’s “Gandhi” film, Designed & coordinated a photographic exhibition on India at the Pushkin Museum, Moscow, and for other television and performing arts festivals in the UK & USA. He has been awarded the SangeetNatakAkademi Award for Stagecraft. Mohan Maharishi is an Indian theatre director, actor and a playwright who graduated from the National School of Drama. He was awarded the Sangeet Natak Akademi Award for ‘Direction’ in 1992.Mohan Maharishi is most known for his revolutionary plays in Hindi, such as Einstein (1994), Raja Ki Rasoi Vidyottamā and SaanpSeedhi. and also countless Hindi plays that he has directed over the years, including, Andhayug, Rani Jindan (Punjabi), Othello, Ho RahegaKuchh Na Kuchh inspired by Marsha Norman’s 1983 English play, “‘Night, Mother” and Dear Bapu (2008). Seema Biswas is an Indian film and theatre actress from Assam who shot into prominence with the role of Phoolan Devi in Shekhar Kapur’s film Bandit Queen (1994). She has a reputation for performing strong character roles. Biswas won the 1996 National Film Award for Best Actress for her role in the film Bandit Queen. She won the 2000 Sangeet Natak Akademi Award and the 2006 Best Actress Genie Award for her role as Shakuntala in Deepa Mehta’s Water (2005). Anuradha Kapur is a theatre maker and teacher. Among her acclaimed productions are Virasat,(2013) Dr Jekyll and Hyde (2012), JeevityaMrit (2011), Centaurs (2006), PataShahar Mumbai,(2004), Antigone Project, (2003) Sundari:An actor Prepares (1997), Umrao (1993). Her writings on performance have been widely anthologized and her book Actors Pilgrims Kings and Gods: the Ramlila at Ramnagar was published by Seagull Books, Calcutta (1993, 2004). She was awarded the Sangeet Natak Akedemi award for Direction in 2004. Hema Singh is an Indian professor and actress. Her first role was at the age of 11 in the soap opera Kyunki Saas Bhi Kabhi Bahu Thi. She later attended the National School of Drama (NSD) in New Delhi. After doing some freelance work as an actress, she became a professor at NSD. One of her most prominent roles is that of Imarti Devi in the television series Kairi — Rishta Khatta Meetha. Ashok Banthia, is a Hindi film and TV and theatre actor and director. He is a NSD (National School of Drama) alumnus known for his roles in Australian TV miniseries Bodyline as Nawab of Pataudi Sr. Vishal Vijay is a theatre professional who passed out from the National School of Drama. He is based in Jaipur, directing dramas & conducting “abhinaydarpan” acting workshop.